What this product is is a mouthful! This is actually my sister’s but we sometimes borrow each other’s makeup bits. She has a lot of base and concealer-type things, while I have an abundance of eyeshadows, so it works out. Anyway. This is the freaking best. We were at the shu uemura counter because my mom was replenishing some skin care items that she tried out and liked. And then this caught our eye. I don’t normally stray away from the color makeup offerings, but I saw this and I thought it was a new product. A review I read of this said that it’s usually stashed with skin care. My sister and I were so amazed at the luminosity it provided. Out of the tube, it looked a lot like The Body Shop’s BB Cream that I used to have—a white cream with brown particles suspended in it. I suppose they’re pigments that kind of “explode” upon blending, lending a bit of tint and color to your complexion. Blended out a little, the sheen reminds me a lot of the too cool for school Pearl Bay Invasion Dinoplatz illuminator, which I love. Anyway, onto the Stage Performer Instant-Glow Immediate Radiance Skin Perfecting Cream! Product Description: “Glow from the inside out! On my face: shu uemura eyeshadow in ME medium brown 885, Addiction eyeshadow in Sandbar, Addiction Revenge cheek stick, Maybelline The Hypercurl Mascara, K-Palette Liquid Eyeliner, NARS Pure Matte Lipstick in Montego Bay, Hourglass Ambient Lighting Powder in Mood Light. Each tube has 1.6 fl. oz. or 50ml of product, which is a lot because you don’t need a lot of this. Just about a pea-sized drop was enough to cover my entire face. In that photo, I set my face with a light layer of a finishing powder, but I didn’t use any other base product. This is a pretty good product, if you ask me! I think my sister paid around Php 2,700 (or around $60) for this, though I’m not too sure. I would suggest planning your purchases when you go to shu uemura, though. They have the best GWPs, in my opinion. shu uemura is not cruelty-free. 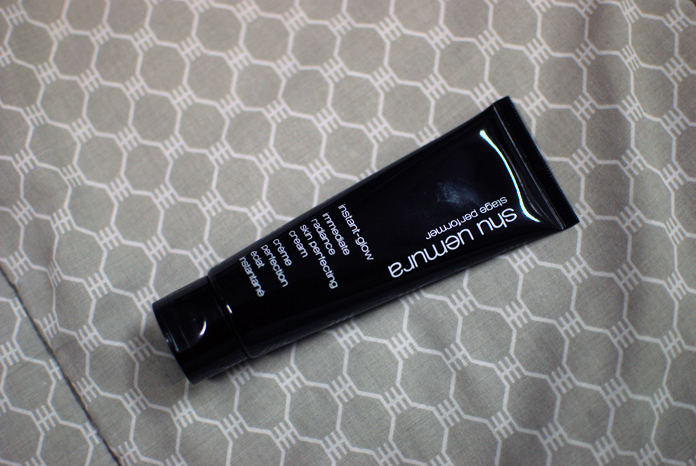 GWP is exactly why I love shu uemura so much it’s crazy. I don’t even have to buy anything and I get so much just because my mom replenishes her big jug of anti-oxidant cleansing oil, lol. And I participated once in their 1 hour makeup program and I got so many freebies with that as well! That looks really radiating on you! I am a BB cream girl through and through though so I don’t think I’ll ever be letting go of that regime. IKR! I have so many cleansing oils, lol. I think you can maybe put this under the BB Cream? Hehehe. Been meaning to ask what your stance is on shu and CF! Also, thank you so much! I’m very glad. I’m not sure if I mentioned this here before but I didn’t know shu wasn’t non-CF until I read one of your previous posts mentioning they weren’t and that is so unfortunate because I really do love their products. Granted I’ve only started being conscious of CF makeup this year. Sigh. I hope they change this in the future! What a lovely product, I just ordered the Shu Uemura lavender primer which is meant to give radiance too, hope it’s good! I’ll try! Hahaha I do have a lot, oops.